The Vitamix Pro 780 vs 7500, which one should you buy? Detailed comparison chart of the 7500 and Pro 780. Breakdown of the features and what's actually important. 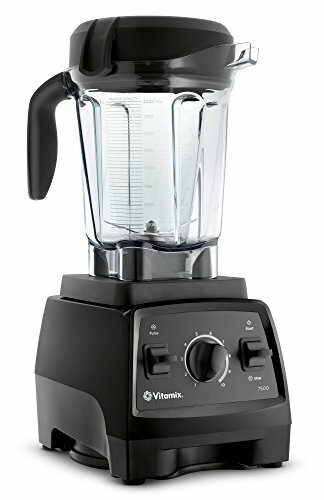 Our opinion on the best one to buy after owning a Vitamix for the past 6 years. Mobile users can scroll left to right on the chart. Variable speed knob with no pre-programmed functions. Both the 7500 and the 780 professional come with the same power motor at 2.2-peak HP. 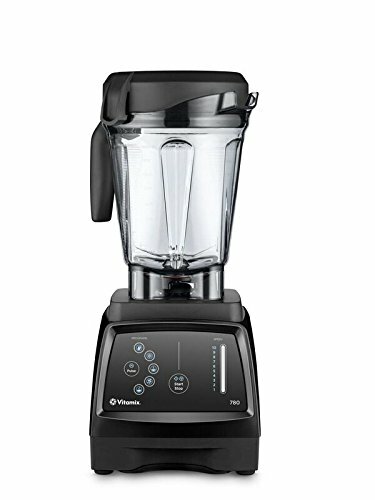 This is the top range for all Vitamix blenders. The older units in the home line are 2.0-peak HP which is still fantastic considering how well the Vitamix is designed. Honestly, you can still do anything with the 2.0 that you're able to do in the 7500 and 780. The difference is that with these you'll have a little more "umph" behind it and it will make tuogh blending jobs just that much easier. The most drastic difference between the 7500 and 780 are the controls. The 7500 has a pretty standard interface - much like the one that Vitamix has been using for most of their history. The 780 on the other hand uses a series of buttons and a control slider. Pulse button: By using this switch on the 7500, it will turn on the blender for a pulse at whatever speed the variable knob is set to. It's useful if you want to do a quick chop of things without pulverizing ingredients. The 780 on the other hand has a pulse button that operates the same way. Simply press the button rather than using the switch. Variable Speed Knob or Screen: The user turns this knob to determine how quickly they want the blades to spin. It's one of the most attractive features on a Vitamix or any high-end blender. It allows you to either get a rough chop or a full puree. It also lets you build up a vortex rather than spinning the blades quickly and having the ingredients splatter everywhere. Now, most Vitamix blenders use a knob with the same style as the 7500 - it's the standard. Pre-Programmed Settings: The 780 has preset settings that you can press and walk away while the blender performs a pre-programmed cycle. These functions are useful if you're really trying to multi-task in the kitchen since you can walk away, but I've never found it much of a problem to do these things manually. The 7500 can still make all of those items and more, you just need to man the blender while you're doing it. Easy Cleaning: Probably the best part about the 780 touchscreen is the fact that it is flat. This makes it far easier to clean than having to work your way around the knobs and switches of the 7500. Winner: Vitamix 780 because of easy to use touch-screen. Both of these blenders come with the 64 ounce low-profile jar. These jars are especially good at handling large amounts of ingredients and fitting into smaller spaces than the original Vitamix containers. They also have a wider set of blades which is great at creating a vortex, even when the jar is at it's maximum capacity line. The only issue is that it's more difficult to blend small smoothie batches or small batches in general. Think about it: you have to fill it up at least past the blades in order to create a vortex. This is harder to do for small batches in comparison to the original narrow 64-ounce Vitamix jar. Luckily - you can buy lots of different sized jars at Vitamix.com. I recommend getting a 32 oz jar for when you want to make smaller batches. Both the 7500 and 780 are from the newer G-Series in the Vitamix line. They have an upgraded motor and motor housing which is designed to be quieter than the original. Just be mindful if you're purchasing extra accessories that they're compatible with the G-Series. Both of these blenders have an excellent 7-year warranty - the same exact one that's standard across new models for Vitamix. When it comes to warranties, Vitamix is one of the best in the business. They've taken care of me several times and didn't hassle me on the phone or ask too many questions. I simply sent my blender back (they paid for shipping) and got it sent back in quick working order. There's not much else to say other than that! There's a few extra color options with the 7500, so you'll have to go with it if you really want a white machine to match your decor. Both machines come with the same low-profile tamper: the best part of any Vitamix if you ask me! All you need to do is stick it through the lid if ingredients aren't going into a vortex while you're blending. It's so much easier than having to stop the entire machine, open the lid, and readjust ingredients. Trust me, you'll love it too! The difference in MSRP from the 7500 to the 780 is pretty substantial. If I were buying it at their prices advertised on the Vitamix website, I would probably pick the 7500. To me, it wouldn't be worth paying a substantial amount extra for the touch screen or extra programmed functions. But you may feel differently if you like things high-tech. Just give me a powerful Vitamix plus a tamper and I'm off to the races! Once you get used to using the knob, you'll probably find the buttons to be more trouble than they're worth. There's no need to pay more when you can do the same exact things with a simple-interface.